High-resolution imaging offered by optical microscopes is required not only for pharmacokinetic analysis, but also for toxicity testing and toxicity mechanism analysis. 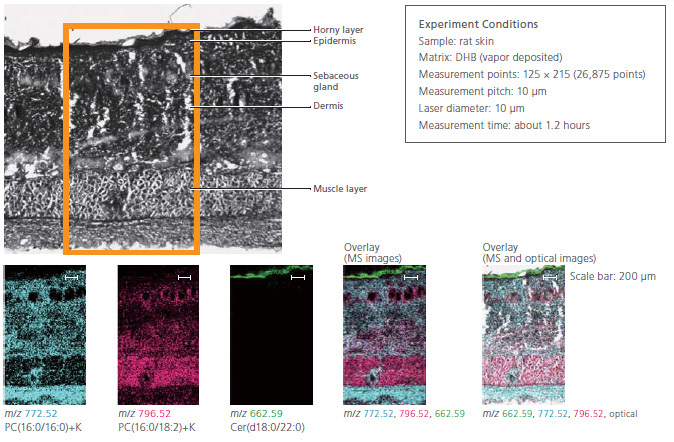 Analysis of the retina and skin requires imaging with high spatial resolution. In this experiment, the fat in rat skin was visualized. High spatial resolution imaging clearly showed localization of ceramide in the horny layer and phosphatidylcholine (PC) in the sebaceous gland. A wide variety of molecules relate to diseases states. Imaging mass spectrometry using the iMScope TRIO can detect a wide range of molecules within a defined mass range. Therefore, distribution information for several target molecules with different molecular weights can be determined simultaneously during a single measurement. Visualization Profiling. By displaying the signal intensity at molecular weight of each target molecule, the 2D location of the target molecules is visualized. All target molecules can be detected simultaneously by a single measurement. Furthermore, samples are measured at a fast 6 pixels per second*, dramatically shortening your experiment time. In this example, the distribution of phosphatidylcholines (PCs) in the mouse cerebellum was successfully visualized within 3 hours (2.5 mm square). Limitations in immunostaining of lipids have previously made visual mapping of these compounds difficult. However this can easily be achieved using the iMScope TRIO, making this technology very powerful, particularly in areas such as brain function analysis and any biological process where lipids are known to play an important role. High-resolution imaging offered by optical microscopes is required not only for pharmacokinetic analysis, but also for toxicity testing and toxicity mechanism analysis. Also, evaluating the phototoxic property of drug candidates requires detailed analysis of the retina and neighboring organs. In this experiment, two types of phosphatidylcholine (PC) distributions in the mouse retina were visualized. The PC (18:0/22:6) located next to the retinal pigment epithelium, which is about 10 μm thick, and the PC (16:0/18:1) located toward the outside the epithelium, can be detected and visualized distinctively. The images show that the two types of PC are distributed in thin layered structures.